Click “Add Alert” to create a new alert. Information form with four tabs will be displayed: “General”, “Recipients”, “Message View”, and “Options”. In the “General” tab you have to enter a title for new alert. Then select a web and a SharePoint list, which changes you will follow with this alert. Attachments are deleted from item. You need to select communication type. These settings can be adjusted in “Edit web part”. In case you have several communication types adjusted, you can choose a required one from dropdown menu. If a communication type is not adjusted, this value is displayed as unavailable (grayed out “Clickatell Sms Gateway” on the picture below). Now, choose “Enable” or “Disable” status. “Disable” means the created alert will not be sent. Switch to Recipients tab. Here you can add a list of recipients who will receive this alert. By default, a user can send alerts to himself only (to “Me”). Your must have an administrator permission or be a member of a group listed in web part’s settings to send alerts to other users. If you have the administrator’s permission, there are several options of recipients’ selection. The first option is a Set of users or e-mail addresses. 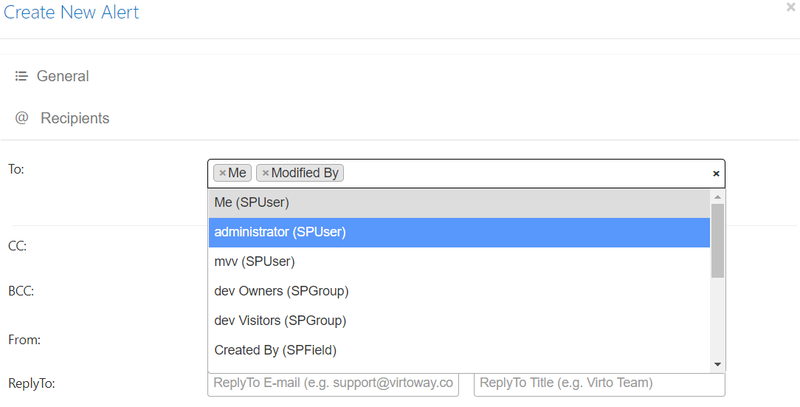 You can start typing at least 3 letters of a username or user group and get suggestions with an autocomplete option. Also, you can select any current list’s fields, that contain users (Assigned to, Created by, Modified by, etc.). For example, you can select “Assigned to” option to send alerts to users assigned to work with a task. This option enables to set any amount of names or addresses. The second option is Me. An alert email message will be sent to the user who has created this alert. The third option is External email addresses. You can type an address in the field and press Enter to save it in recipients list. You can assign multiple recipients in this field and select both recipients from a field in current list and recipients with emails. In this case, you will send them all this alert. You can also send alerts to users from a SharePoint Contact list. Click on “+” next to Contact List and fill out fields to select location, name, and view of list. Next, you can add optionally field values for carbon copy and blind carbon copy. These fields have the same rules to add addresses as the field “To”. You can also add “From” and “ReplyTo” values to your email alert. Note: Please ensure the smtp server is properly adjusted and doesn't have security restrictions, which are interrupting alert email delivery. Switch to the Message View tab. There you can see default alert tags in message body, which you can change as well as any other information in a message. Default tags are already displayed on message body. You can delete them and add your tags by clicking on tag icon. Click “+” next to Header or Footer to open and customize these sections. The “Body” section allows you to define a message view for recipients. You may include links, pictures, or tables into the alert e-mail. You can create tables in your alert and define the value of table border and columns width. Choose the count of columns and rows in your table. 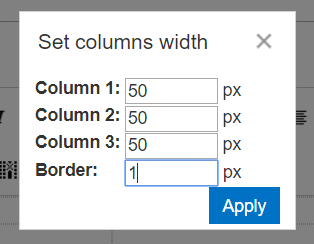 Then define values for columns width and border in pixels. Now, you have a table in your alert message. You can add or delete columns and rows with additional buttons. Note: if your alert has an item from lookup, the item will contain link to view form of this item. For example, if your alert has a “client” lookup field, you receive in alert this field with link to client`s card view form from lookup. 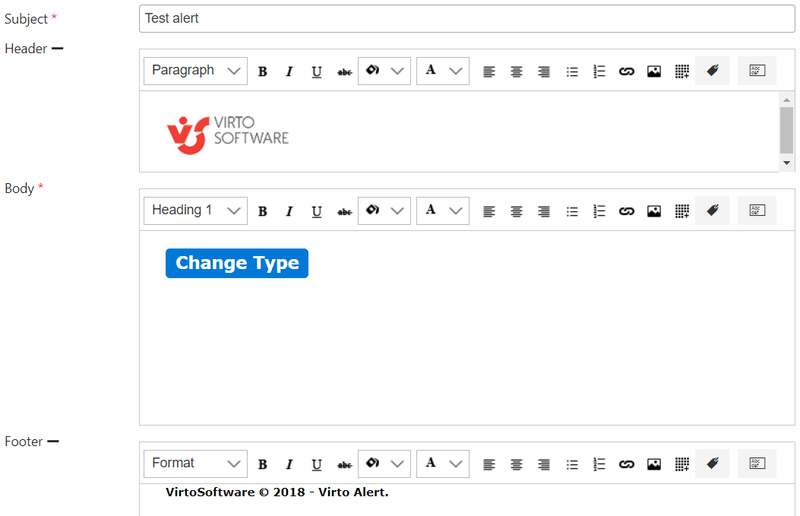 You can add to message some list field, which values will be sent in the created alert. 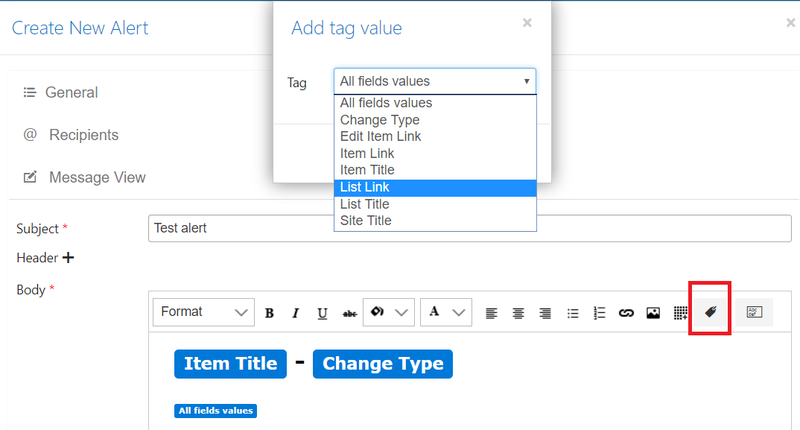 Click on the “Add field value” button in email body and choose required values for tracking in the created alert. In the following example, we will track “Title” field changes. 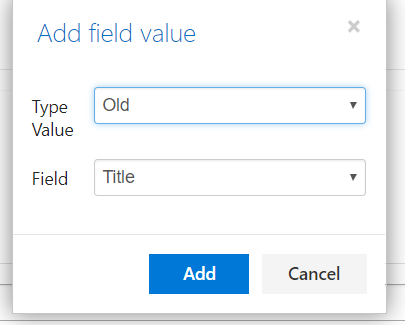 Choose “Old” or “New” value type for tracking and select a list field for created alert. 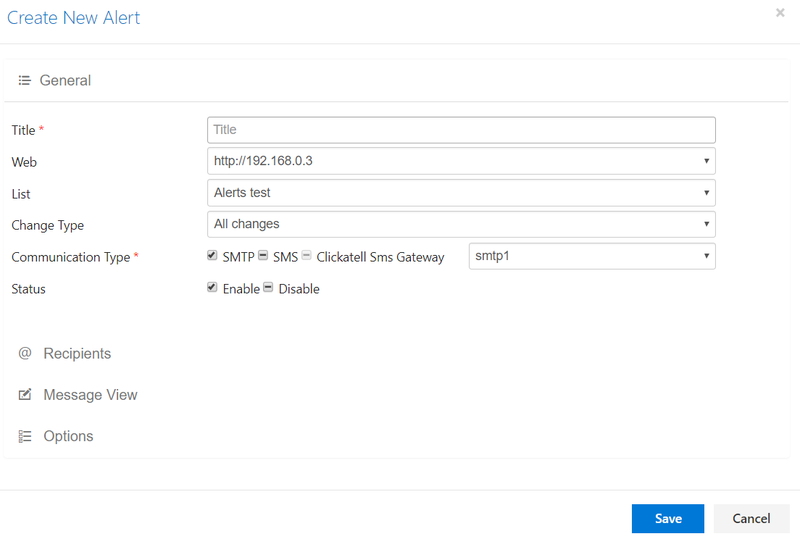 You can create your own custom schedule to send SharePoint Alerts, that means you can define conditions for sending and a period when alerts should be delivered. For instance, you can receive an alert if someone changes an item only within working hours (8 AM to 5 PM). You can also define days of week to send alerts. There you can also define an External host path. External host path allows users to replace the host part of the site link, item link, and item URL, that can be inserted in e-mail alert messages. This feature is usually used to provide SharePoint users logged in from external local domain with a public host path to the SharePoint web server. For example, if you enter http://wssportal.yourcompany.com/, outside users will receive alerts with links on item but site links in their e-mail alerts will be changed from http://YourInternalServerName/ to http://wssportal.yourcompany.com/... and will be available for those outside of the network. Choose a changes type, according to which the alert will be sent. You can create a custom condition for more precise selection of items, that trigger the alert. Click “Use condition” and define an item field, select a condition from list and type a value. You can add several conditions, using And and Or operators. You can add new condition by clicking on “+” button or delete a condition using “X” button. 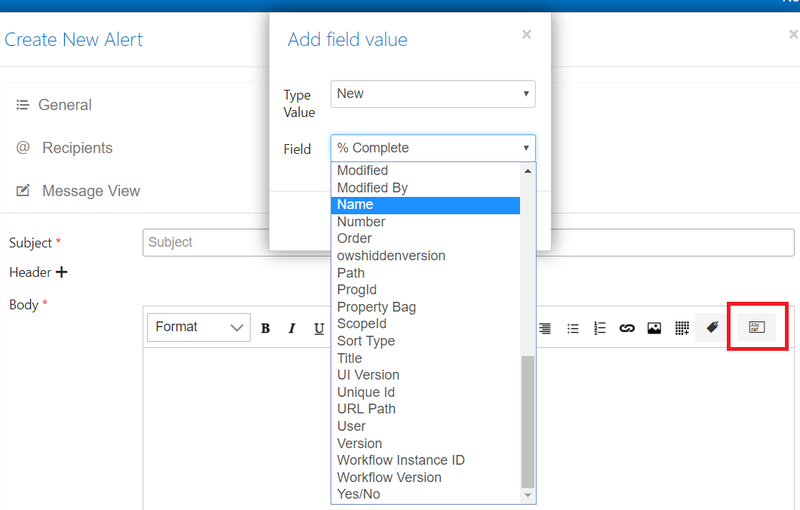 To track changes in a specified list field, select “Use condition”, choose the required field and use “was changed” or “not changed” condition. If created condition includes values from multiple choice field, use delimiter “|”. Then you have to define the alert schedule. You can send it immediately after any changes occurred or create a daily or weekly summary schedule. 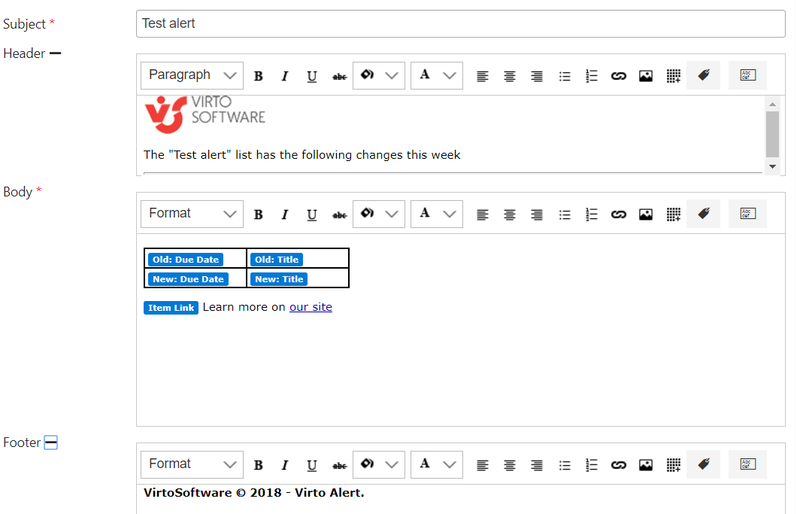 If alert condition was triggered a few times per day, all alert emails are merged in a single daily (or weekly) summary alert. If you select “Send a daily summary”, select required time from dropdown and tick boxes with days when you will to receive a summary. Alert will be sent according to settings at 10:00 only on Mondays and Wednesdays. “Send a weekly summary” option allows you to send alert on a chosen day of week. The next option allows you to send alert on the specific date based on the list’s date field value. 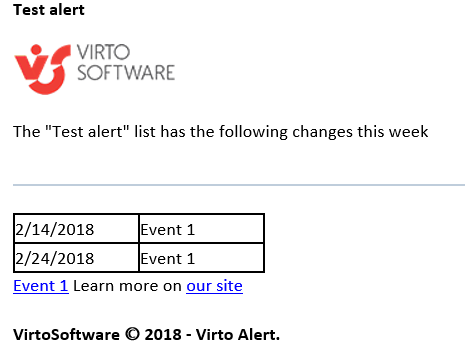 You can send alert on the same date as the date from a chosen field value. In this case, you need to set the exact time when the alert will be sent. You can set time for “After” and “Before” options as well. Note: If the format of a chosen field is not the Date and Time, but Date Only, you have to set time for alert sending. The same setting can be required if you send an alert for recurring events or for an all-day event. If you do not define a time, in the example above it will be used time of field “Due Date”. If this field has a date only and doesn’t contain time, email will be sent in midnight, using server time. You can send an alert according to a day count from a value taken from a custom number type field. For example, you have in a list the Due Date field and a custom number type field. Select the option “Send on date depending on a field value” and choose Due Date field. Then you can assign a count of days from a custom field to send the alert. For example, the value in the custom “Number of days” field is 3. Select the “After X number of days specified in field”. Then choose the custom list field with a number. In this example, we have value “3” in this custom field. This means, you will receive this alert on the third day after the date in the “Due date” field. You can customize the schedule to send reminders. It is possible to send daily reminder before or after the specified number of days. In the example below, a user will receive reminders at 14:00 in 2 days after and 1 day after the event was modified. Press ”Save” to save the created alert.